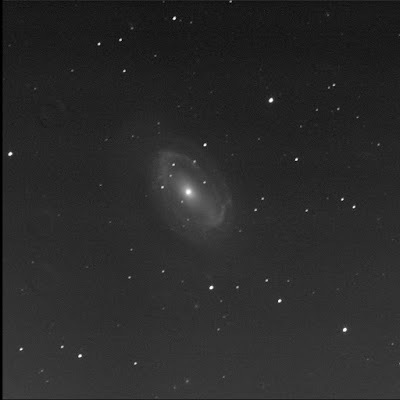 The Burke-Gaffney Observatory robot imaged NGC 4725 for me. A large galaxy in Coma Berenices. It is one of the RASC Finest NGCs. Luminance only, 60 seconds subexposures, 10 stacked shots. FITS Liberator, Paint.NET, GIMP. North is up; east is left. Very interesting shape. It's like there's an arrowhead at the north-east. Huge faint halo. There is a small dim fuzzy south-south-west of the big spiral: LEDA 1734926. South of 4725 is LEDA 1735228. It is slightly larger than 1734926. Far to the south, at the bottom edge of the image, are three points of light in a row, almost equidistant. SkyTools shows the west object as a star, J125024.9+252012, but it looks like a round lint ball of a distant galaxy. The next fuzzy to the east again ST3P shows as a star. ST3P shows LEDA 1732526 at the third point. Curious. It is the dimmest of the three, to me. LEDA 1743969 is north-north-east of the big galaxy. Is it very small but bright. The shape of NGC 4725 reminds me of a creature but I can't remember what it is called. I also think it is surprisingly similar to a trilobite.